I am a drummer, improviser and composer working within the Contemporary, Jazz and World music scenes. I come from a musical family and grew up immersed in Big Band Jazz, Free Improv, Classical music and 1960s Pop. I have performed across the UK, Europe, North and South America and Asia. In the past I have led groups performing my original music such as Mayday Project and Stories. This year I set up the group Land of If as a vehicle for my songwriting. I gained a first class honours degree in music from the University of York, where I delved into the music of Béla Bartók, György Ligeti and Igor Stravinsky and studied Electroacoustic music, Indian music and Contemporary Jazz with John Taylor and Julian Arguelles. I have also studied Jazz at Newpark Music Centre in Dublin, Ireland, Carnatic Music at Brhaddhvani in Chennai, India and Music Pedagogy at the Kodály Institute in Kecskemét, Hungary. I take lessons with drummer/percussionist Paul Clarvis and in 2015 I received a bursary from Help Musicians UK to study rhythmic language from traditional cultures with Barak Schmool and Harmony/Arranging with Pete Churchill, which was a dream of mine for several years. Other teachers that have had a profound influence on me include Tom Rainey, Ambrose Field and Seán Carpio. I am a passionate educator and work with many different organisations to engage young people in music through workshop programmes and tuition. I have collaborated with a diverse mix of musicians, from Mercury-nominated folk singer Sam Lee to experimental punk band Magnus Loom and multi-award winning vocalist Lauren Kinsella. Performance highlights include supporting Robert Glasper Trio at Ronnie Scott’s International Piano Trio Festival and Jools Holland at Greenwich Music Time with Elliot Galvin Trio. With Ghanaian-inspired group Vula Viel, I headlined Kings Place Festival, Songlines Encounters Festival and opening the 2015 London Jazz Festival at Ronnie Scott’s Jazz Club. This year I was part of Brighter Sound’s Jazz Director’s Series, working in a ten-piece chamber ensemble with legendary US saxophonist Chris Potter & Inner City Ensemble for a UK tour of new music. My music has been performed at the BBC Proms and broadcast widely on national radio and I have appeared on critically acclaimed albums by Elliot Galvin Trio, Engines Orchestra, Vula Viel, Lauren Kinsella’s Thought-Fox and Raph Clarkson’s Dissolute Society. Collaborative projects I have been part of include a multi-disciplinary show based on Sephardic folklore with the ten-piece electro-acoustic ensemble Sefiroth; ‘Dreamland’ – a multimedia installation at the Turner Contemporary featuring the Elliot Galvin Trio; and a dramatized interpretation of T.S Eliot’s ‘The Wasteland’ at the Happy Days International Beckett Festival. I also set up and ran the cross-arts platform Pop-Up Circus, staging exhibitions and live events throughout London from 2011-2014. 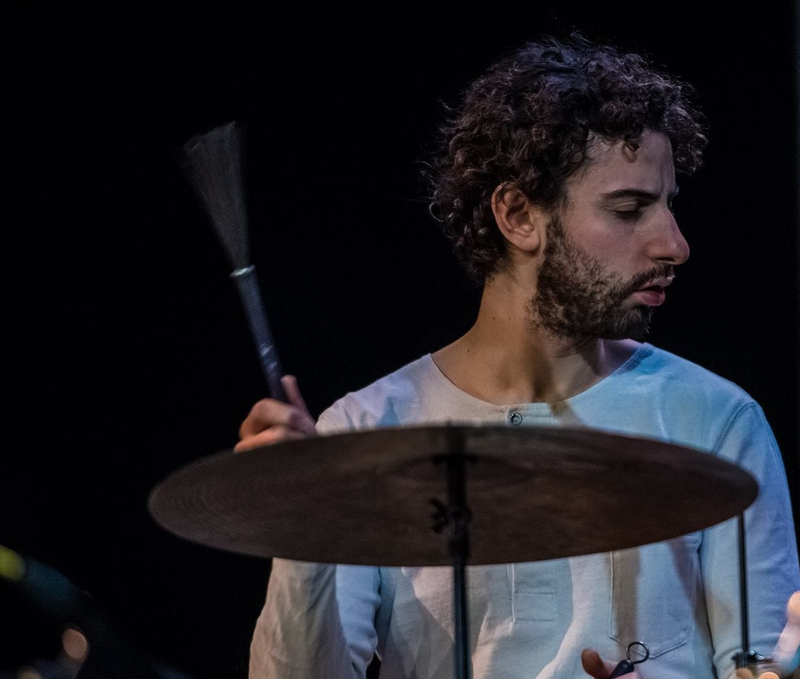 “Simon Roth’s drumming is always just perfect – subtle, imaginative, in the pocket and never too loud.” – London Jazz News.